Renovating your bathroom can be an exciting project and will only increase the value of your home, but it can also turn out to be super stressful experience if you can't seem to settle on a design. From patterned tiles, to wallpaper and bold paint colors — the choices can be a little overwhelming. Here are 15 inspirational ideas to get your modern bathroom design running smoothly. Bring warmth to your modern bathroom design by adding solid wood accents. A minimalist design can turn cold fast. 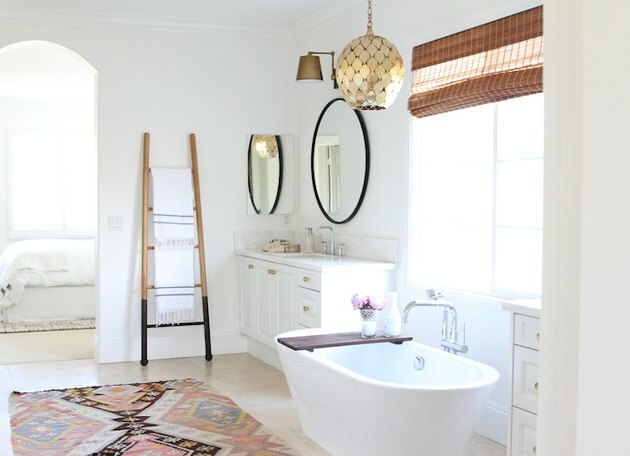 Warm things up in your bathroom by adding wood accents like this space by the blog Place of My Taste. 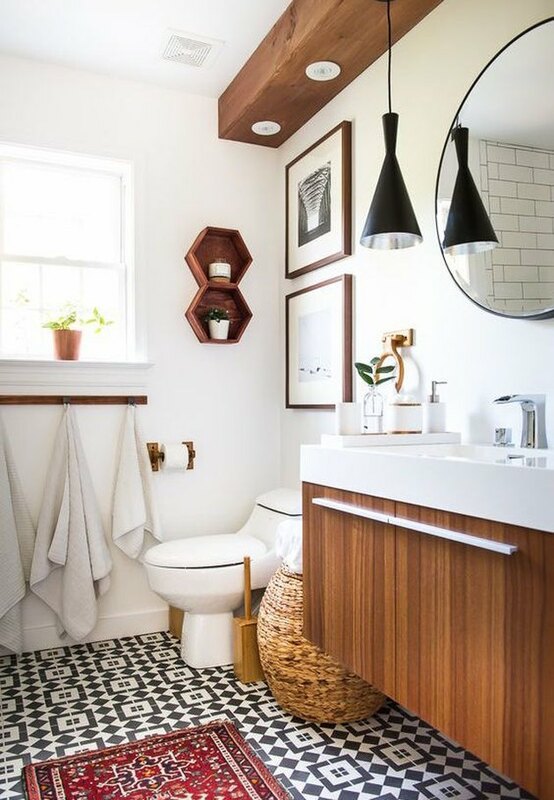 The wood vanity, towel bar, ceiling beam, and hexagon shelves go a long way in making the bathroom feel cool and casual while still maintaining a minimalist vibe. Create an accent wall behind the vanity with patterned tile. The bathroom is a great place to take a bold risk and this tiled accent wall proves it can pay off in a big way. The marble mosaic backsplash with chocolate brown accent tiles gives the look of trendy wallpaper, but is something that will withstand the test of time. The black framed mirror adds just the right amount of curve to a bathroom full of sharp angles. Enjoy spa-like tranquility with a freestanding soaker tub. The showpiece in this gorgeous bathroom designed by Becki Owens is obviously the luxurious freestanding soaker tub. If you're doing renovations, you might as well go big so you can come home to your own personal spa every night. Give your bathroom an eye-catching design by layering similar patterns. 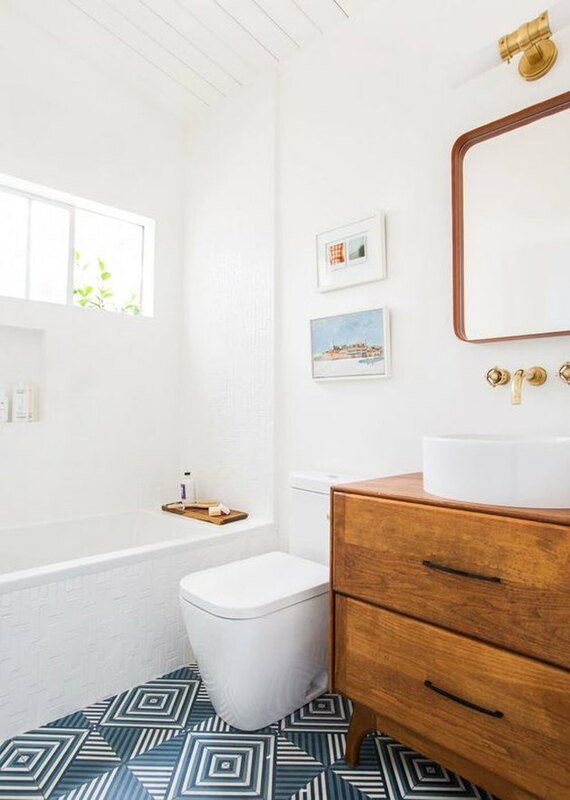 The rug and tile floor combo in this neutral modern bathroom by Hello Hoku is a prime example of how to do pattern-on-pattern the right way. By keeping everything in the gray and white color family, every element enhances the next. The similar pattern of the rug and on the cement tiles allow both to seamlessly blend together to create a cohesive layered look. 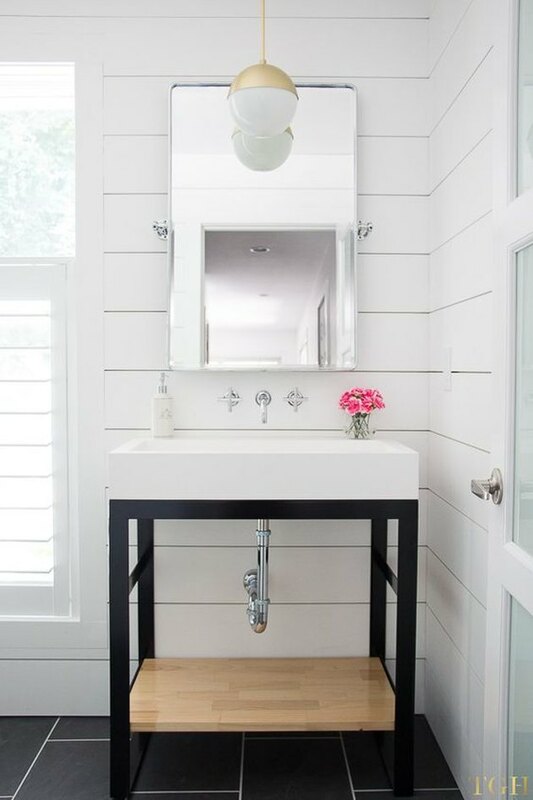 Make your washroom feel larger with a floating vanity. Keeping as much of the floor exposed as possible, will make even the smallest bathroom feel grand. 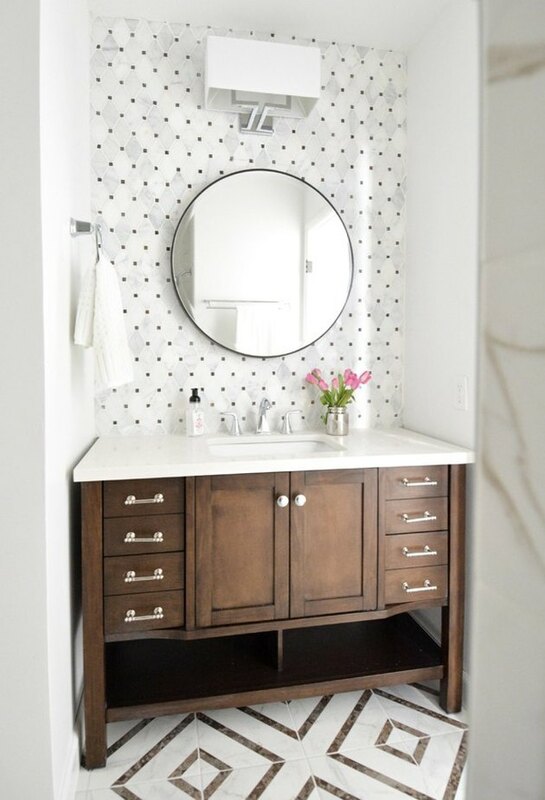 The floating vanity in this streamlined space opens up the design while still providing ample amounts of storage. Laying standard subway tile in a unique contemporary pattern makes the bathroom unique without a hefty price tag, too. Pay close attention to the little details to give your modern bathroom a high-end feel. Small details, like the unexpected triangular legs on the vanity paired with a faux fir stool give this bathroom an air of elegance that is hard to beat. 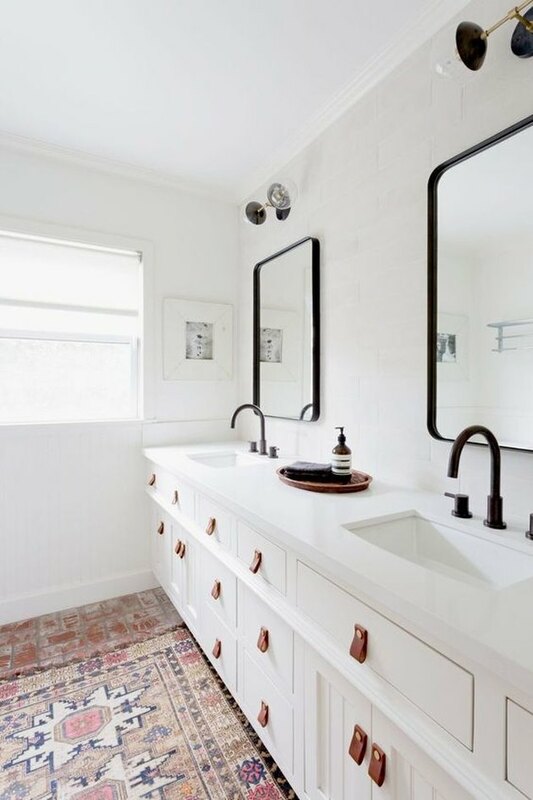 Incorporate leather drawer pulls to balance out black faucets. The best designs are ones that are balanced. This master bathroom by Square Foot Designs features buttery camel leather drawer pulls with gold studs that are the ideal counterpart to properly compliment the matte black faucets and mirror frames. The vintage rug also adds both pattern and a subtle pop of color to tie the whole thing together. 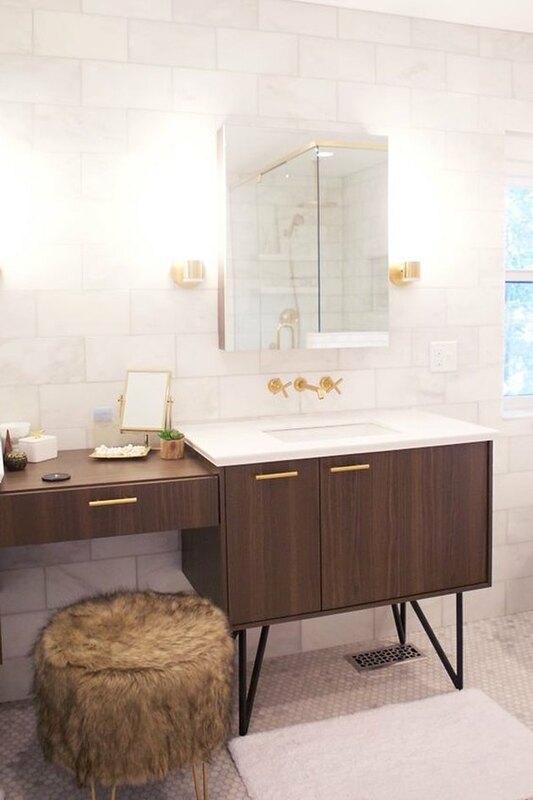 Even a small bathroom can feel luxurious when paired with chic gold finishes. This small bathroom proves you don't have to have a lot of space to get big results. 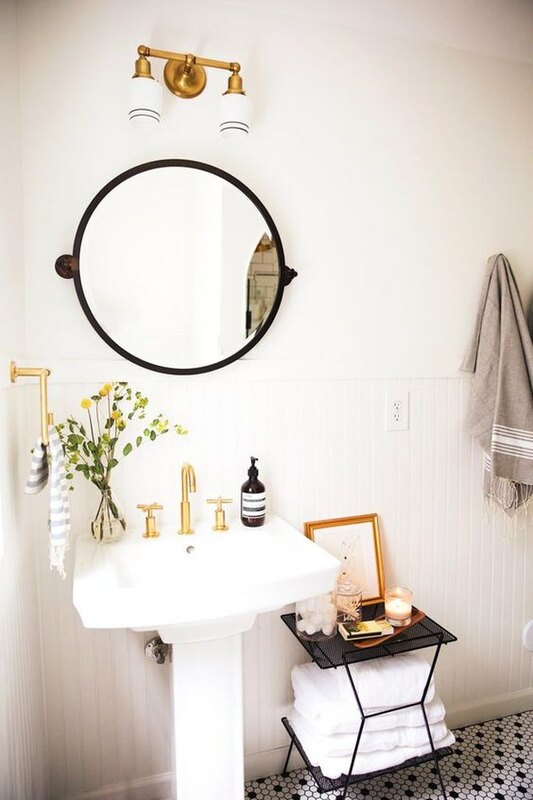 An ordinary pedestal sink gets a glam makeover when paired with a gold faucet, hand towel hook, and light fixture. The black metal side table offers an easy solution for the bathroom's lack of storage and perfectly compliments the mirror and tile floor, too. Choose a bold patterned floor tile to set the tone for your modern bathroom. 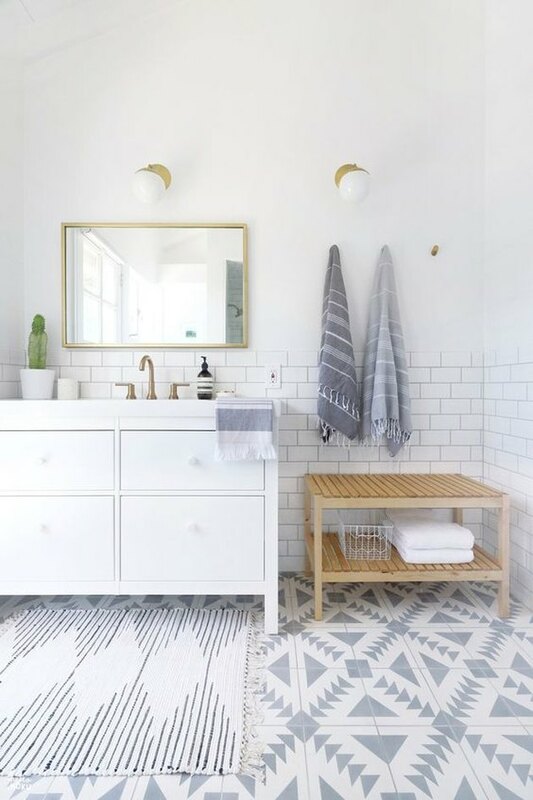 If you don't know where to start with the design of your bathroom, begin by picking one bold element, like the blue and white geometric patterned tile in this bathroom designed by Emily Henderson, and go from there. Sometimes just picking a starting point in the hardest part, but you can't go wrong when you start at the bottom and work your way up. A neutral black and white color palette will never go out of style. Black, white, walnut and brass is a color combination that will still be current years from now, so invest in a timeless design to get the most bang for your buck. 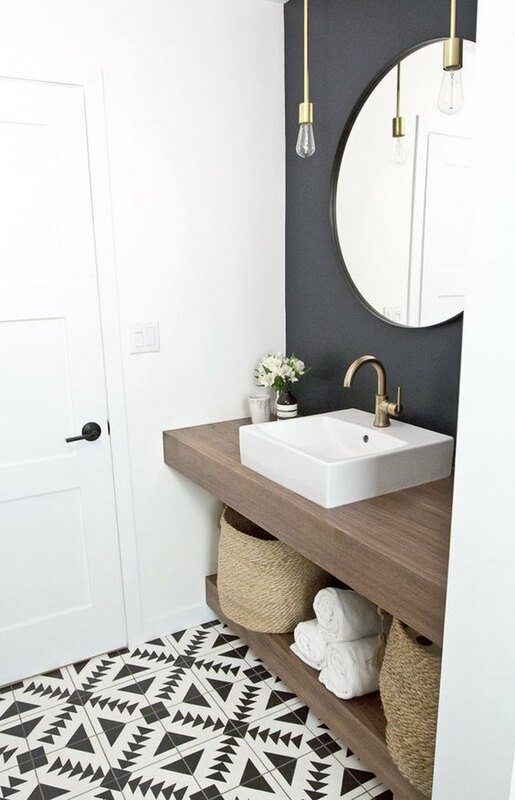 The high-contrast black accent wall behind the vanity shelves is the one detail that makes all the other elements work together harmoniously, so don't hesitate to break out your paint supplies when inspiration strikes. Make your modern bathroom decor flow with the rest of your house by incorporating non-bathroom furniture. 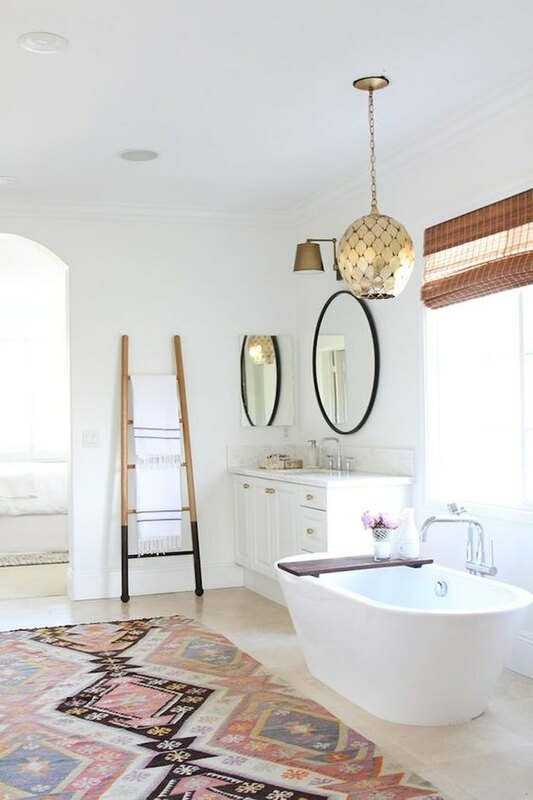 This eclectic creation by Bre Purposed is a bathroom with a clearly defined personal style that is effortlessly cool and modern. 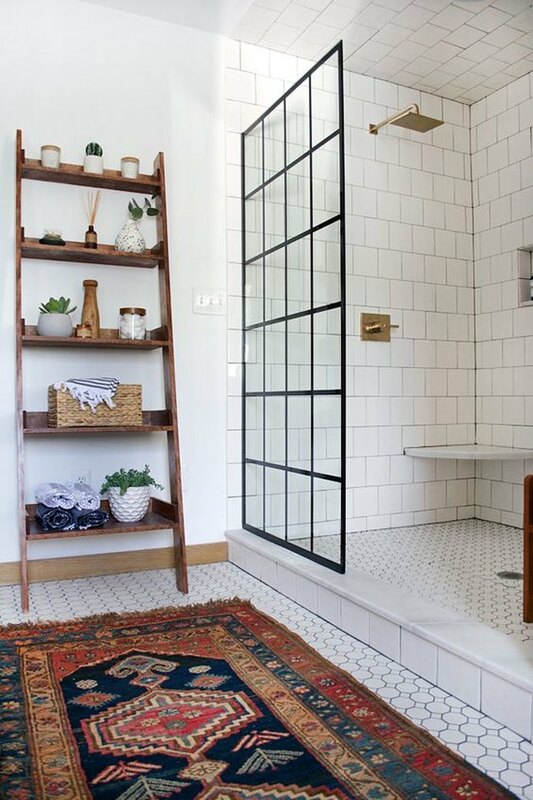 By incorporating pieces that are traditionally found in other rooms of the house — like the wooden ladder shelf and kilim rug — the bathroom feels like a completely natural extension of the home's main living areas. You can probably guess how the rest of the house is decorated based on this one room alone, and that's a good thing. Paint the inside of the bathroom door black to ground a minimalist design. This bathroom by Little Green Notebook uses the power of paint to totally transform the space. While the room would have still been great with a white interior door, the black adds an unmatched level of sophistication. Accentuate industrial architectural features with black paint. If you have exposed pipes in your bathroom, don't paint them the same color as the wall to try and make them blend in. 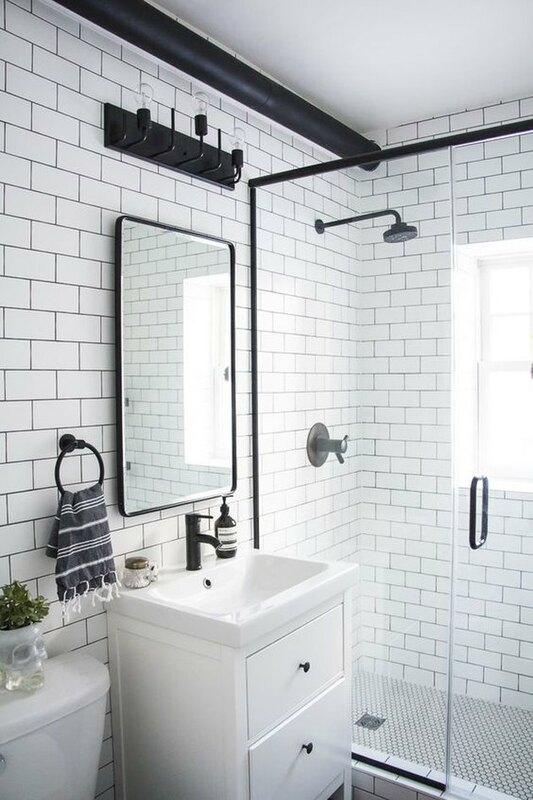 Follow designer Kristina Lynne's lead and paint them a dark color to give your bathroom a modern industrial feel. Keep it going and choose matching black fixtures and dark grout for a clean and traditional bathroom you'll never get sick of. 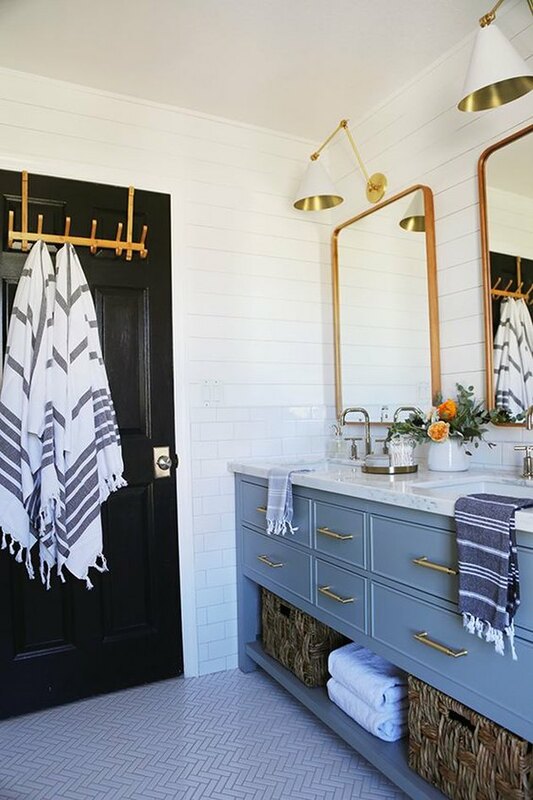 Mix metals to make your bathroom feel layered and on-trend. Trying to settle on finishes and deciding if they should all match or not can be a tough one — but it shouldn't be. This airy restroom shows how well mixed metals can work when placed side-by-side. 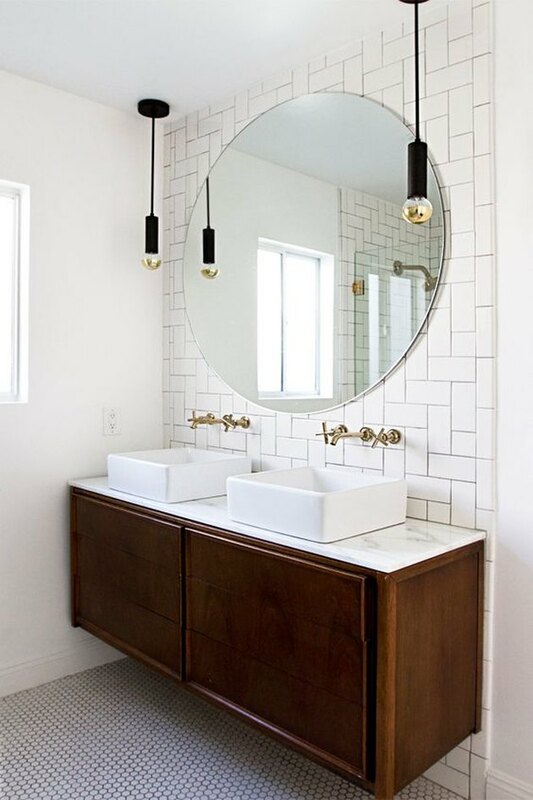 The black steel vanity, polished nickel faucet, and brushed brass light fixture look like they were always meant to be paired together. 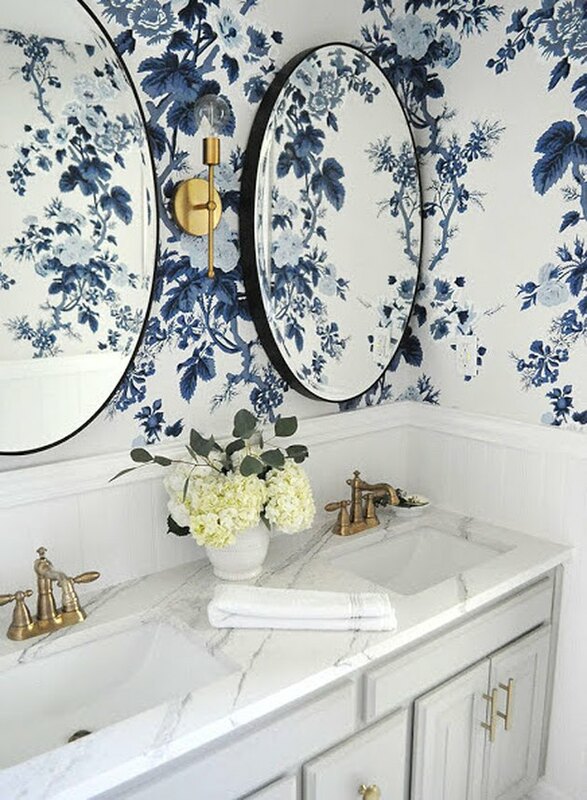 Use wallpaper for a quick and satisfying bathroom update. If you're looking to give your already renovated bathroom a little makeover, consider picking up a few rolls of wallpaper. This bathroom proves that wallpaper has come a long way and is nothing like the stuff in your grandmother's house. The best part of this project — you can easily change it out anytime you feel like it.